In the coming days, weeks, and even years, there is no doubt that thousands, if not tens of thousands of stories will be shared about Mr. Hockey. An amazing man, what is almost as remarkable as the Mr. Hockey himself, is that each and every one of those stories will be unique! Upon hearing of his passing, I was compelled to add my voice to the thousands of others and share my “Gordie Howe story”. In 2011, the NHL Alumni graciously invited their new volunteer writer to the Scotiabank Pro-Am in Toronto, which raises funds for Alzheimer’s research. For a writer new to the craft, to not only be invited by the NHL Alumni to one of their events, but to be welcomed with open arms and given complete access behind the scenes was astounding. I’ll forever be grateful to Wendy, Dylan, Mark, Carly and Debbie for helping make that happen (on more than one occasion!). After having my mind blown multiple times that weekend; staying at the same hotel as the guys, riding the Alumni bus to events (being sworn to secrecy by Mike Krushelnyski because I was a rookie! 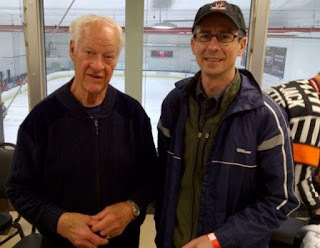 ), and as I mentioned, having access to the “Alumni Room” at the rink, the opportunity to meet Mr. Hockey actually happened quite unexpectedly. The generosity of Hockey’s Greatest Family was not only extended to myself, but to my best friend and editor, known to my readers as “Ed”. He joined me part way through the weekend and we spent much of that day in the Alumni Room; enjoying the stories and conversations, and seeing firsthand the friendships that spanned the years. Friendships forged as teammates and from on-ice battles. As Lanny McDonald once told me, when you join the NHL Alumni, you’re all on the same team. The room overlooked one of the rinks in the multi-rink complex in Toronto and at one point we saw that Chris Nilan’s team was playing Colin Patterson’s team down below. We had spent a great deal of time chatting with them earlier, so thought we’d head down to ice level to watch the action up close and take some pictures. About ten minutes into our time at rinkside, Ed looked up and saw Mr. Hockey in the window of the Alumni Room, looking down at the action, enjoying the game. A few choice words were exclaimed as we looked at each other and said simultaneously, “Back upstairs! !” – we did not want to miss this opportunity to be in the same room as Gordie Howe. For those that have never seen behind the scenes at an NHL Alumni event, there are usually hundreds of jerseys there for the guys to sign. Jerseys that are then in turn donated to various charities. One table was overflowing with Detroit Red Wings and Gordie Howe memorabilia, and sitting at the table, hard at work, was Mr. Hockey himself. Not wanting to just walk up and interrupt, we asked Dylan Wade (a great friend in the Alumni office) if he could introduce us. Dylan explained to Gordie and a friend of his that was travelling with him at the time, that I had written several articles in the event program and was volunteering as a writer helping to raise awareness about the association. We all said hello – Ed and I were thrilled to just be in the same room. “Oh no,” we said. “We have taken up too much of your time already!” But Gordie would not hear any of that!! He signed a program for each of us. That was one of the most fascinating things about spending time with him – the care that went into writing each autograph. He knew that his signature was special (and cherished) by every person that received one. We watched him for over an hour and that same care went into every one. “Pardon?” I stammered. “Feel my knee,” he said again. So, next thing I knew, because I was being told to, I was on my knees feeling Mr. Hockey’s swollen knee. “Arthritis” he said as I proclaimed to Ed that yes, it was extremely swollen. Then, we sat and chatted. Ed showed him pictures of his own backyard rink and within seconds, Gordie was asking him what kind of lumber Ed had used. How had he built it? I sat and watched my friend talking to Mr. Hockey about their backyard rinks – Gordie had built his own back in the day and seemed to approve of Ed’s craftsmanship! And after some time, it was back to signing autographs. And, we just sat and watched Mr. Hockey being Mr. Hockey. Remarkable. A few years later, I was asked to write an article about Gordie’s life in 800 words or less for the event program of the Calgary Pro-Am for Alzheimer’s research. Um… really? 800 words or less?? How was I going to pull that off?? Luckily, I stumbled upon a website that broke down the career points of NHL players by decade. And, when I began to examine the numbers by decade, I began to truly understand one aspect of what made Gordie Howe “Mr. Hockey” and created my article. While I did not attend that Calgary event, Carly (another great friend from the NHL Alumni office) made sure that I received a special gift in the mail. My article about Mr. Hockey in the Calgary Pro-Am program, autographed by Mr. Hockey himself. The NHL Alumni truly is Hockey’s Greatest Family, and today, we lost one of the greatest. Keeping the Howe family, all of their friends and NHL Alumni teammates in my thoughts today. What else is there to say, except, thank you Mr. Hockey - for everything.